In our last update in our Fulltime RV Living journey we told how we were planning on taking off in October to travel fulltime. Everything we moving smoothly and we were very excited. We purchased a camping membership, had our first travel routes planned and the campgrounds picked out. We’d been working hard on getting everything ready inside the camper for traveling and we had a really big rummage sale and sold everything we had left that we didn’t need to take with us or that wasn’t a memory item. That was until Friday the 13th. No, I’m not a superstitious person at all. I don’t believe the date was any more than a coincidence but it certainly will always be remembered as the day where our lives were turned upside down. A call from the realtor that was selling our house was all it took. Through no fault of ours (but thanks to a crooked appraiser and a few others that apparently don’t care about other human beings!) we learned we were going to lose thousands and thousands of dollars on our home and there was nothing we could do about it. (It’s a long story but trust me, if there was something, anything that could have been done we would have done it.) Our entire world, all our plans, all our dreams for the next few years…gone in an instant. With no back up plan. Over the weekend we tried to come up with what we could do. There’s no way we could travel with that much debt from the house still over our heads, I’d never feel comfortable and we’d never be able to pay it off. So all our travel plans went out the window. We considered staying where we are currently at and living in our camper but that would require living in the same campground for at least 2-3 years before the debt was paid off and I wasn’t very excited about that prospect either, plus it would be very hard to pay off the debt with campground expenses on top of our camper payment. Not to mention my husbands job was about to end in a matter of weeks. I’ll admit that I spent most of my weekend in tears. It seemed like such a dead end. We turned to another plan. After we were done traveling we planned on buying land so we decided to look into that idea. We even went and looked at a few places but then we talked it over with the bank and discovered it was not financially possible. (Huge down payments on land, plus the costs of digging a well, building a driveway, septic, ect.) Back to the drawing board…. During some part of our land search, this small little farm popped up. My husband thought it was so cute and we both agreed it was incredibly priced (aka less than what we pay on the camper, no kidding! ), but I wasn’t interested. I didn’t want another house and the problems that go with it. After all of this searching (which was only in a matter of a few days but seemed like forever!) we still didn’t know which direction we should take and just kept praying that doors would be opened for us, even if they weren’t doors we planned on or thought about or even were comfortable with. We would take what we were led to. We really didn’t have another option. After some debate I decided we should go look at the house. It was just 4 hours drive from where we are now and I figured that when we looked at it my hubby would be able to see it wasn’t for us and we could move on. Once we got to the house I felt something I didn’t think I would feel. The little farm was perfect for us. Small house (but I still felt like it was HUGE compared to the RV! ), a small amount of land but big enough for animals, the ability to be self sustainable (alternative heat, huge garden, well, ect), and it just fit. So with all our other options exhausted we decided that we would put in an offer and see what happened. If it was accepted (Our offer was lower than the asking price, which was already low.) then we knew it was meant to be. Twelve hours later we had an accepted offer and were on our way to being farm owners! I’m still in shock over the happenings of the last 2 weeks. In a single week we found the house, made an offer, got it accepted, and more. In just 4 weeks (as long as everything goes ok with inspections and appraisals) we will move into our tiny homestead and farm. The camper will be sold and our dream of traveling will be put on hold until it’s meant to be, if it’s ever meant to be. Oh and believe it or not the hubby already has secured a job in our new town so no stressing over that! It just so *happened* that his exact job that he is trained and licensed for, was available in the town next to the homestead. It’s less pay than what we are used to but we are determined to make the most with what we have! Those are the positives and that’s what we chose to look at. If I started to think about the negatives my heart will be in a sad state again. And our journey is far from over yet to get moved into this homestead. Plus we have no furniture since we got rid of everything and no money to buy things with for a while so it could get pretty interesting, but since we know this is where we were led, we trust that it will all work out in due time. Sometimes life throws us things like this. Even though at the time it seems like the end of the world and you feel like you’ve lost all your bearings you just have to keep believing there is something better for you out there, even though you can’t see it yet. After we got our news I felt like our world ended and we were devastated and felt lost, but deep down we knew that the right path would be there for us, we just had to look for it and start knocking on doors waiting to see which one would open. Like I said, even though our journey is far from over and probably about to get quite interesting, we trust there is a plan in all this. When was there a time when you felt like your entire plan for life changed in an instant? How did you cope? Thank you so much for sharing your story! You certainly have had to have a lot of faith recently. May God bless your family! this brought me back to the year when a virus attacked my husband’s heart, a tornado picked us up in our house, and we lost a baby. I am so HAPPY for you! Like I was telling you two weeks ago, I just knew something great was going to come out of all this, even though it did not feel like it at the time.. I got goosebumps when I was looking at the picture. 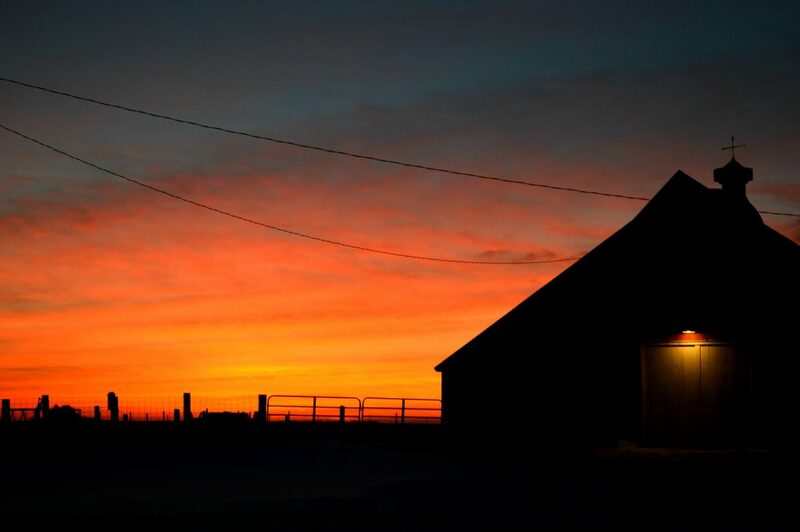 The intense glow over the farm looks like God is giving it his blessing. 🙂 This is your new “little house” and soon you will start having all kinds of new adventures. I can’t wait to see all the posts you will share about life on the farm. I might have missed this, but did you former home actually “close”? I was trying to figure that out as well. Thanks for clarifying. I am so sorry for what your horrible weekend held for you. It’s devastating to learn of large financial losses but…..with time you truly absorb it & move over it to where you need to be. Thankfully that hurt is only temporary. Hope you’re able to move past the debt quickly & concentrate fully on your new little farm!! How cute!!! And how exciting buying all “new” for your new home!! It’s humbling to start over but super fun to try new things!! Wow. Big change! But it’s all in your point of view. If you see it as starting over and all an uphill climb you’ll get depressed. You should see it as an ADVENTURE! Think of all the stuff you can do there! Check out flea markets and all the webpages about how to recycle old “junk” into useful or decorative things. Plant your garden and try out different kinds of seeds! Also, try to go little by little so as not to get overwhelmed. Remember the phrase about no matter how slow you’re going (talking about walking or jogging) you’re still lapping everybody sitting on the couch. Well, the same analogy applies to you. Little by litte and every day will bring new and interesting challenges, decisions, inventions, discoveries… You have a great opportunity! Oh there are many things I’m looking forward to, and I will post in another article! (This one got quite long!) I will have a huge garden, plenty of space to roam, and thankfully me and hubby both consider ourselves to be mostly crafty/resourceful so we will make do even if it’s not always with traditional methods! Isn’t it funny how life has a way of working out? I will be saying extra prayers for you and your family! It is all in His plan and His timing. your house is gorgeous looking just like something I would luv to have. sometimes even when we think we are following His plan He decides right then and there to change it up because there is something oh so much better to come! I am so grateful that you shared your story and for all you teach on your blog. I am sure you know that God will see you through, but I just wanted to let you know again. You will be in my prayers. The Lord works in mysterious ways – I’m sure you know that already. When we are thrown into unfamiliar territory I am reminded of Jeremiah 29:11. Blessings to you and your family as you start a whole new chapter in your lives. Wow, you have had a lot of changes. Thanks for sharing. Being self sufficient is going to be what everyone needs now. May God bless you and your family. WOW, I have to say I have been following your website for over 6 months now, and it gives me such inspiration. Thinking about how hard that must have been for your family gives me butterflies, but it is good to know that there was another plan working in the background that you did not figure. We may have to move soon and I am nervous but excited, I cannot plan for everything but I have faith that there is the ultimate plan playing out that I cannot always see. Thank you for sharing great ideas and feelings. Things do have a way of working out for the best! May God continue to bless and watch over your family! I enjoyed your story so much. Thanks for sharing it. Thank you so much for sharing your heart today, Merissa. Your words have inspired me to move forward; away from the door that He recently shut and into the light of the door He has opened. You see, I lost my job exactly one month ago today. It was sudden and (somewhat) unexpected. I was fired – there I said it and now, hopefully, the tears will begin to dry and healing will begin. My heart was shattered and I have been frozen; unable to move forward and embrace whatever this next chapter of my life holds for me. I had pushed everyone away, except my wonderful husband, and I have kept him at a comfortable distance. Your words and the song you shared have liberated me today and I cannot thank you enough. You are a blessing. You go girl and I am sure that when you do get to travel you will enjoy it so much more than now. You were meant to be self sufficent….it is written all over your site….you and your family will be way ahead of lots of people in the future. Yes, the whole last year has been upside down, twisted, turned. It’s slowly settling down, but still keep getting blind-sided on occasion. Not even sure how we are getting thru it other than just one day at a time. What an adventure! My dad use to say, “Life is an Adventure, Live it to the fullest!” Sometimes what we plan is not what God has planned for us. How blessed you are to start over. Not many people get a do over in life! Life is very unpredictable, we should plan to a certain extent for the things we want, but it should always be done with a God willing attitude, because life can and sometimes does change in an instant, we lost our one yr old son in 1984 and in 2007 we lost our 18 yr old daughter, six months after her accident my husband lost his job, another daugher had to have major surgery, in 2012 my husband was diagnosed with kidney cancer and this yr I was diagnosed with basal cell carcinoma, but through all this there have been many miracles too. My oldest daughter was told to terminate a pregnancy because there was only a five percent chance of survival for her baby. Three yrs later she is growming thriving perfectly healthy little girl through God’s grace and healing. (Drs and radiologist said never seen that happen before) it is amazing what God can do for us when we let him. He gives us comfort and peace when we ask and trust in him. You are a very strong young lady and an inpiration to us all you will do just great. Remember before there can be a rainbow there has to be rain. God Bless you and your family on your journey. What an amazing story! My husband said the same thing the other day…we are going to have to go through the storm before we get to see the rainbow. Judging by all those big trees, I think you might be moving East? If so, here’s another “pro” for you: your gardening should be easier and probably more productive 🙂 Looks like a great place! Yes, east! I never thought we’d move that way but I’m SO excited by the big beautiful trees. I think we have 2 full acres of them. The garden plot has been there for probably over 100 years so I’m thinking it will be very fertile! Awesome! We didn’t end up where we had planned (not even in the states we were looking in!) when we found our homestead either, but we love it and have been so happy here. You just never know where life will take you! Can’t wait to hear more about it! The farm looks lovely. It will bring you new adventures. I have seen such creative ideas online for making furniture from free pallets and curtains from drop cloths or burlap. And check freecycle. Someone may be giving away just what you need to get by for now. Good Luck !! The upside, all of your prep for full-timing with preserved foods etc. are not wasted. It will be interesting if you feel like posting before and after pix of yur farm. Trust me living in a rv can get old fast and boring. we lived that way for 6 years far away from home and family missed weddings and the like. how far can u travel for the rest of your life? I wish you the best of luck with your new home! It sounds like an incredibly trying time, and hopefully things, while difficult, will work out the best for you and your family. I’m jealous of your new adventure and homestead! 🙂 My husband and I are now expecting our first child next February, and have realized too late that our lovely suburban home isn’t what we want after all. I hope in time to find a farm house of our own. I think I like the title God-sufficient and not self-sufficient. I am 51 years old and have been through some challenging times. I have a neighbor who has a small farm. I have given a few things to this neighbor/friend and she has given a few things to me. I have seen the self-sufficiency books at the Tractor Supply Store. I do think, at times, we are supposed to be working toward Christian Community. A constant focus on Self-Sufficiency is Self Focused. What if an emergency came and your family was called on to share with your neighbor(s) or your neighbor(s) wanted to share with you? I don’t know where you are from originally, so I wouldn’t know east from west, probably wouldn’t anyway lol. My question is are you moving to a place where there is lots of snow in the wintertime? I love snow and I would love an old fashioned farm house, lol. Keep us posted and take pics as you go along. We are from South Dakota and even with the move we will still be in South Dakota. I looked it up and supposedly the area we are moving to gets an average of 41 inches of snow per year. I’m THRILLED! I love snow! You are a young woman; I have been up and down this road a few times (and all around the mountain a few times, as well!). Biblical pun, of course. This verse helped me overcome every “change in circumstance” which I, with my tunnel vision, saw as a problem at first. We see through myopia, often in shades of gray; the Lord sees the whole picture, in every detail, and full living color! It is for your protection, and/or that of your loved ones, that things have worked out as they have. Someday, you will know the “why”. Rejoice! Celebrate! He covers you always, in all ways! apparently, God’s plan was a bit different from yours. I still think you got the best deal ever. continue on your path. it looks wonderful from here. I am moving to a 5 acre farm with my best friend next year. she is retiring and moving to the land in December and I will follow as soon as my little cottage is built. I never thought this would happen. I bought a house in 1994 and thought I would sell it when I retired and buy a small plot of land. I got sick in 2002 and lost everything. but God had a plan for me too. I found good friends over the past several years and am more content than I ever was before. my good friend is generous enough to include me in her plans and I will be forever grateful. God has put us together to take care of each other in our later years and I looking forward to this new life….and raising chickens again. love my chickens….eggs only….im a vegetarian. The farm looks very cute! I always look forward to your posts and adventures! Your story came at just the right time and so inspired me! Wishing you and your Family every happiness and abundance. Let the adventure begin! Wow I was having palpitations FOR you as I read the beginning of the situation! I get really panicky when it comes to things like that. So glad it all worked out for you 🙂 God’s timing is amazing! Another quote from the Little House books I like is, “There’s no great loss without some small gain.” Eventually you may find that your gain out-weighs your loss. Besides, there must be a purpose for this happening like it did. It may take time till the “why” is revealed, but everything happens for a reason. A lot of people (including myself) wish we had what you have, and would happily forgo the temporary lack of furniture. It’s ok to mourn your loss, but eventually you gotta let it go and start looking at the bright side. Lol I have to tell myself that fairly often. Good luck and best wishes! God bless, He has a plan for you. Hang in there. What an inspiring story! Its so hard to remember that God has a plan for our lives- and that His plan is for our good. Keep your faith and all will continue to work out well! Thank you for sharing all your good and bad with us so we can learn from you and support you when need be! You all have been more support already than you already know! Hang on to the Lord – He knows what is going on! We lost EVERYTHING in Katrina. All we had was the clothes we packed when we evacuated, and we did go back and salvage some ceramic/china/glass pieces that the marsh mud didn’t ruin. Our house had water into the attic. My husband had evacuated to his work, along with our oldest son. I took my 2 youngest kids, mother-in-law, and our dog and left the state to evacuate. I got a call in about 2 days that we lost everything when the levees broke. It was extremely scary, because we had no idea what was to be. But God had seen everything, and prepared the way. We had visited a new area of the state earlier that year(March). We fell in love with it and decided we’d retire there, in 4 years. We went back in July to look at property, and had made reservations to come up again for Labor Day. Well, Katrina his Aug 29. I picked my husband up (oldest son went to his fiance’s family’s house) and we went up to our reservation in the other part of the state. God moved us, but 4 years earlier than WE planned. We stayed, and have a beautiful piece of property – it turned out to be our dream property. We love it here so much. Looking back, we can see God directing all our steps to lead us here. HE worked it all out much better than we could ever have done. It’s been hard at times, but SO worth it. You will have a testimony too! Thank you for your story Nancy. It’s great when others share what they’ve been through so many more can see the light at the end of the tunnel. God sees everything and knows what we need when we need it better than we do. I thank God for His mercy and compassion and how He leads us where we need to be verses where we are now. Wow, you are very lucky that adorable farm found you! You’ll make a wonderful life there, it looks so peaceful, so homey. I love it!! Off topic, but months ago we won a pressure canner off of you, and I’m happy to say we made our first batch of applesauce tonight! I think 3 more batches to go from a nice apple picking session at our family farm, so again…thank you!! Merissa, you’re going to be so happy on your little farm. What an adventure! GOD is faithful and HE know the plans HE has for us even when we don’t. I love the looks of your little place. We live on a small piece of land too and it’s just right. You’ll do great! When I look back over my life, I wonder how I made it through some of the things, but I did and you will too. GOD bless you and your little family! Merissa wow! God knows best! What a change of events! The farm is lovely looking! I hope you will have everything you need there. What an adventure life can be if we are open to what God has. Thank you for sharing! Starting a new chapter in little house living. What a great story, not a happy ending…but a wonderful beginning to the next chapter of your lives! Keep on keepin’ on!! You are an inspiration to ALL! Thank you for sharing your story with us. I’m sure it is a shock to have such major change of plans. But as some of the posts have mentioned about RV living it didn’t quite work out for them even thou they wanted it to. Maybe this is a blessing in disguise. I am going thru a major change in my life too by retiring from the Air Force. Thank you for posting the inspiring words and song! You are a strong lady and it will all work out for you and your family. Thank you for sharing your story. I really needed to read this as I am going through something right now and don’t see a way out. However, I know God will bring me through. He has never failed me. I know He led me here to read this so thank you for sharing. I sympathize with you. I have been in the same emotional position in life. After the anger and tears, I took stock of what I had to be thankful for, which is plenty, and came up with another plan, and joyfully moved on. It is amazing what we think is our destiny and what happens in reality. Good luck and God Bless on your NEW adventure! God has indeed lead your in different paths! But in the end it ususally works out for the best, sometimes we know not why we are led in the ways, but we must go through the valley to get to the top. Please email me as I have a couple of questions for you. I hope your little farm will be as good to you as your family will be to that lucky little farm. What an amazing story; we are pulling for you! I am a firm believer that everything happens for a reason. You are purchasing a beautiful little place. It is my DREAM to own a place like that! Be happy, my dear, because life is what happens when you are making plans! What a wonderful story to share! 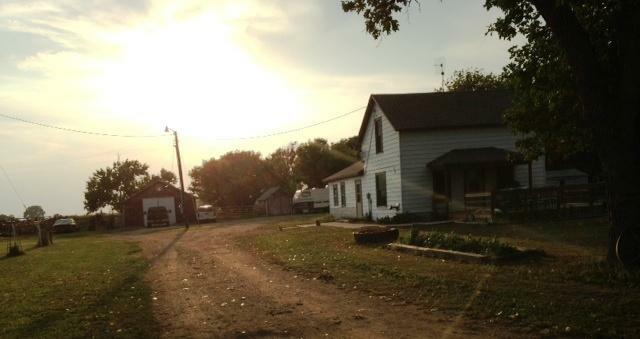 I was really impressed with your pics of your camper… now I can hardly wait to see pics of the farm house and land!!! Wow, what a whirlwind! I can’t imagine those ups and downs in such a short amount of time (and the emotions that go with them), but I am really excited to hear about the blessings you already have to count. I learned a while back that my plans often pale in comparison to the One who sees the big picture. I am sorry you have had to go through this tough time, but I personally am really excited to see what you make of this unexpected fresh start! Check to see if there is a freecycle site somewhere near you or check craigslist and check the free category.You may be surprised what you find.Good luck. I am a big believer that things happen or not happen for a reason. I was both sad and happy for you as I was reading your post. As this story is sounding strangely identical to the one that my brother is going through now, I am a little curious. Keeping in mind that you mentioned the crooked people involved, the fact that you cannot do anything about it, and that there is a long story to this, and also NONE of my business, if you have not yet closed on your house, is there a way that you can back out since most of the preliminaries were done under deception? I know that you have a realtor advising you and I am NOT trying to upset you in any way, shape, or form, I was just wondering since you guys seem to be victim’s of somewhat criminal activity I am thinking. Granted we are in a different state than you, but my brother and sister-in-law were able to stop their closing because of actions taken by crooked, uncaring people. We tried to do something else but they basically forced us to sign the papers otherwise the people buying were going to lose their loan, would have to move out of the house (they already moved in and trashed the place, realtor talked us into that too…) and we would have had to find new buyers AND fix up all the damage, costing us even more. It was just a bad deal all around. I am a Realtor, and when I had read in one of your earlier posts that you gave possession before closing, I had to cringe. I would never, ever advise that a client give possession before closing (especially now days, as so many problems come up even down to the day of closing) It is just awful that you had to pay the consequences financially because you were trying to be accommodating to the future buyers and they repay you buy trashing your property! But what’s done is done, and it is good that you are looking to the future instead of dwelling on the past! Good luck with this new adventure! Wow! It is amazing how when we put out the effort and look at the positive, even the most disappointing, devastating things can get turned around. You are a true survivor! You took action and did whatever it took to make sure you would be OK! I’m sure you will have plenty of furniture and everything you need in no time! 5 years ago, I got a divorce and left my husband everything except my personal belongings (such as shoes and clothes and memory items) and moved into a very tiny apartment, with an egg carton foam mattress as a bed and blankets and sheets that I took with me. Within 3 months, my little apartment was full of furniture, thanks to my friends, second hand stores, freecycle.com and the free section of craigslist! I was amazed at how quickly I was able to accumulate so much stuff! I’m sure you will be able to recover everything you need for your new home in no time! Good luck to you and your family, I hope this little farm brings you so much joy! Thank you so much for sharing your journey. I am encouraged to hear of others who seek to honor God with their time, talents, money, etc…. and be willing, joyfully to live in His will. I hope the Lord blesses this new chapter and that you find yourself being settled in your new home quickly. I do not presume that my story will be of encouragement to you, but I thought I would share none the less. God bless you and yours. Hi Merissa, I follow you and your struggles for a while now, and I’m amazed for your strength of mind. Here in Italy we say that the Lord never closes a door without opening another one, I think it’s your case. I pray for you and your family: be strong, everything will be ok! I’m sorry to read about your unintended change in plans. Wishing you all the best for your upcoming journey with your new home. I can’t wait to read all about how you are decorating and what you are making with a very limited budget. I just came across your blog, I’m not even sure how, but I just spent the last few hours reading nearly everything you have written and adore it! You seem so similar to me and my goals in so many ways! We recently took a 40% paycut and moved all the way across the country on our own dime. We have a family of 6 and live on a TINY income. The main reason we chose to move, was so we could be more self-reliant. We want to have a big garden (not really possible in the phoenix AZ area), chickens, and possibly rabbits. We want our children eating food that was grown and prepared by us, for us. Its hard living in the world we do and I am grateful for your website and its information! Congrats on the new homestead! I am glad that a tough week turned out to be a better week. Good luck with the move! Really Mark? We have not sold it yet, still waiting for the right family to come along. I will shoot you an email. Thank you Merissa. I found your site while looking for a recipe. I’ve referred back to it a few times lately and then tonight I saw your story of faith. I’m learning Faith right now. It’s hard. Your story encouraged me and showed me what it looked like. The song by Josh Wilson was just what I needed to hear tonight. So Thank you. I’m glad you enjoyed it Trish. Oh Merissa! You will enjoy your new home as you and hubby build many new memories. The other day my husband and I looked around our house and chuckled at the furniture we had…couch and two recliners given to us by a friend, coffee table given to us by our son, dining table and chairs from mom’s estate, bedroom dresser from yard sale, night stands from mom’s estate, stove from used appliance store, desk from Goodwill, one tv from our motorhome!!! Little by little we will replace the hand me downs with items we want and like but we will do it debt free. It is great not to be a slave to new things!! God bless you! Wow Becky, sounds like you have been on quite the long journey lately too! It sounds like everything is starting to look up for your family though 🙂 Thanks for the well wishes. Just want to say that you inspire me! I am a 35 years old RN with 6 dogs (crazy) but I believe that they are gifts from God to us and so I regard them as precious and when I find a lost or stray one, I cannot look away which is why I now have 6 which is also why I am trying to get out of my 2600sqft house into a mobile home on a good piece of property. I look to you as my inspiration and I hope that it will please God to give me courage to move away from the familiar and the safe to where I will need my faith to get me through. Thank you for this blog, you have a reader here in the lone star state :). I was so excited about my idea for you, I didn’t proof my message. Sorry for the typos! This year has been a bit crazy for us also. My husband was layed off work around Christmas time last year. We decided to plan a trip to Chicago. It was a great trip as a family, it was our 1st week trip as a family and we went from Port Huron,MI to Chicago IL on the train for the 1st time also. My husband was on unemployment from Dec-March 18th. I miscarried our baby on March 18th. Also that day was when my husband also left for North Dakota to find a great job. I had to stay behind with the kids from March 18-July 3 because the kids where still in school until June 7th. I had to go to the doctors a lot and to the hospital a lot to make sure the baby passed out of me fine. That was so devastating for me. ( I want another baby still, I do have an 8 and 6 year old). I felt so alone without my husband since he was 22hours away from me. My husband’s family and our friends lived by us in MI,but it wasn’t the same. Also ND is 2 hours behind MI,so that was a challenge also. The kids and I moved to ND with the help of my parents. I love the area here in Dickinson,ND. The area is so different than MI. My husband is making more money out here than he has ever made in his life. My husband started driving to Minot,ND March 18 and was working at a job he went to college for March 20th. I couldn’t believe it. Things happened at that job and now we live in Dickinson,ND. My husband’s company owns the apartment complex we live in. There are 3 other families that live in our complex. We’re 1 big family it feels like. The people in our building are truly my 2nd family. I miss my family and friends dearly, but my now “extended family” helps us through it. I know how things can change.husband lost job few yrs ago now we all been sad depressed lost. We lost everything have been living apart off and on.I signed up for aprt.with youngest daughter.husband living in rv on land with a very unlivable small house.he hasn’t worked on it and seems happy as things are? Don’t know what will happen.I know I miss a house with a big kitchen. I miss privacy I miss all family comin every holiday I miss decorating I miss home. They sold our home way less than we owed. Very sad still. Nothing has been same none of us are the same. I get up every day and try to have faith I Pray and won’t let myself give up on having a home again some day. Thanks for your story. You never know what life has for you in store and that’s what makes life even more interesting. Couldn’t agree more with you on this. Hi Merissa, this is the first time I have ever messaged you, but I wanted you to know how much of an inspiration you have been to me. I found your website while looking for a cheese danish recipe, and I have been reading your stuff ever since! I am now trying to live a more simple lifestyle, from cloth diapering to scratch cooking everything, I am learning so much on your blog. My family and I (husband, 2 year old daughter, and 4 month old daughter) have always had issues when it comes to housing. In face, in about another 2 months, we are having to move again. It’s been really rough on the family, but we try hard to just lean on each other to get through everything. I do my best to focus on the things that I can control, like feeding my family, and the things we make. Keeping busy keeps my mind off the “what ifs.” I think your new house looks beautiful, and I’m trying hard not to be jealous of you 🙂 I just keep telling myself that we’re making baby steps to get there ourselves someday. Keep us updated with how you are, and know that we are all rooting for you! I’m excited to see what your new home has in store for you! Thank you for taking the time to comment Lori, I really appreciate your encouragement! Wishing you love and everything wonderful. Many thanks for sharing your story. We also are in a place we never thought we’d be in but life goes on and you count your blessings, make sacrifices, adjust your outlook and your dreams, and thank the Lord for a wonderful spouse and family. Wishing you a wonderful new adventure. I just found your website and have enjoyed reading some of your articles. I am looking into living in an RV full-time so I find your series helpful. I hate what you’ve been through in the course of a year or so. You seem to have a positive attitude. Now that things are settling down I’m sure you’re going to enjoy the holidays! Did you sell your RV? I am looking to purchase one and like the layout of yours. Hello. I just discovered your website/blog with a link for recipes for skin care, etc. And I kept reading, and reading . . . I was very interested in the events around full time RV life and moving to the farm. We sold out house over 2 years ago and have been fulltime RVing in our motorhome with our teenage daughter. We just changed homeschooling to roadschooling and did a major downsize of everything we owned. We have traveled some and had some long stays. Ready to house hunt again in a new area. I am intrigued with the circumstances causing you to loose thousands of dollars on the sale of your home because of a crooked appraiser. Would you mind sharing what happened so we can be forewarned? I am happy that you have been able to change directions and plans as needed. It’s kind of a long story but we originally bought a foreclosure and fixed it all up. The appraiser wanted to go off the price WE paid for the house when we bought it from the bank, thus losing us all the money we put into the house. He refused to care that we’d completely re-done the inside, added a huge garage, decks, and more. Then our realtor decided not to stand up and fight for us and by the time we found all this out we had to decide that day whether to take the offer or lose the sale and start from square one (with the lowered price anyways since they had already “labeled” the house with that). The buyers were already living in our house (HUGE mistake that our realtor also talked us into). That’s the short of it…it was a mess. I would just highly recommend selling your house with someone you trust VERY much. I was googling something RV and found across this post. We’ve been traveling in our RV for over 2 years with our two boys and four pets. Now we have a little one on the way. I’m so sorry about what happened with your house. That’s terrible but it sounded like you handled it with grace. It also sounds like a wonderful plan unfolded for you. When (if) we decided to settle down, we’d like to do a little homestead as well. We have our eyes on a few areas but we know it’s not time to put down roots just yet. Oh yeah…I loved the Open Range you had. One the families we spent last winter with in Colorado had the same rig. The kitchen was amazing! We are looking for a new one right now and if the back bedroom had two slides it would be perfect for us. This is an incredible documentation of an epic journey. I loved reading this. My wife and I have been contemplating hitting the road very soon (no kids) in fact I am decided and ready to go and she is still contemplating. I’ll let her read this. Thank you! I found a funny saying that sums up where I am in my life right now….. If you want to see God laugh….tell him your plans. Yep, sums it all up. Reading through all your adventures on this RV page on each link and then this really inspired me. I lost my job in November and I have days where seems like the end of the world. I love your attitude and prayer does change things in ways we never thought about. But, He has our plans for us, He promised. We just went through some thing like you did. We got a home at a unbelievable price so low we didn’t have to take a loan out on it. The house we got had not been lived in for more then 18 yrs and has a lot of work to be done. We had just started it when I had troubles with my eye sight. I would end up in the ER and a brain aneurysm was found. A month later I had the surgery to fix it. It did put us behind in house repairs. We moved in a week before my surgery. That was back in Oct I was not to lift any thing heaver then 10 pounds for a few months. We have just started to do the remodeling again. It’s been a long winter here and this house was not ready for it. That is ok by next winter we will have this one to look back on and know how far we have came. Did you sell your camper. Loved reading about your journey. It is encouraging as we contemplate moving into a camper and begin selling our things while waiting to see what comes next. We will be borrowings friends fifth wheel for a month. We will keep our house during the process. We a re a military family and just about to retire in a year or less. We could leave now, but we think another year gives us the necessary time to prepare, but we believe we will live a camper for the majority of this next year if we can find the right camper. Yes we did sell our camper when we moved into our house. Good luck with your upcoming journey Tina! Thank you and good luck on your homesteading. stumbled upon your blog when looking into full time RV life. love your stories! On the other hand- I know that gypsy blood runs boldly through my veins and I wonder if that lifestyle will ever satisfy me. Will I the allure of the open road, nothing tying me to one spot, and the adventure of places unvisited, sights unseen always whisper in my ear? Will I always feel that I missed out on life if I don’t answer the call? Will I become bored and lose my zest for life after daily routines turn in to yearly routines? These two parts of me fight ALL THE TIME. How can one person have completely opposite desires? Farming is a long process, planning years in advance. You can’t just leave for a month to travel. Who is going to care for your livestock, the garden, the orchard, etc? RVing full time has it’s own set of problems – the main one being having an income to support doing all that fun stuff (even if you are debt free it costs $ to do all that cool stuff and pay for gas/insurance). And even if you could afford it would you burn out? Would you feel like you were on a merry go round that you couldn’t get off of ALL THE TIME (like ‘Groundhog Day’). Would not having a place to call home get old really quick? Would I long for the stability and routines of the farm life? Anyways…I stumbled onto your sight looking for RV stuff and after reading each entry found out that in the end (for now) you ended up on a farm. It literally made me laugh out loud. I can completely empathize with your heartbreak! You are actually lucky to be young enough to “start over”. A similar thing happened to my hubby and I three years ago, but we are in our late sixties. Sadly, the culprit was my truly evil sister-in-law, who thought nothing of lying on the stand in court. We lost everything and had to move between two countries in only two days. I can’t express how upset I was. Everything we could keep had to fit into the back of a borrowed pickup and an open trailer (4 X 8′). I am happy to say that we are now living on the other side of the country and have recovered from the shock. Our life is modest and in a manufactured home. We had to sell our car but we paid cash for our home. We do pay a modest fee to our seniors’ community but we are safe and comfortable. Not to mention we are as far away from my husband’s sister as possible. I know it has been a while for you too, and I hope that things are happier for you and your family on your little farm! I’ve been reading your story for the past hour and a half. There are a lot of things that I have not thought about for a life of full time RVing, and wanted to thank you for opening up your life to us. I’ve first introduced the idea of living in a tiny house to my Girlfriend, and the benefits of living debt free in a smaller space and how it would make us appreciate what we have ((both material and each other)) and she was to say the very least, apprehensive at first. Soon she came around and we’ve been looking for ways to get into RV style living. We’ve decided to buy a retired school bus and renovate that into a full time camper (( With my father being a handiman by trade, and a good friend of mine being a plumber who agreed to work for a case of beer, and my self with a fair bit of wood working under my belt)) we think this is our best chance at a debt free life. I just wanted to share our aspirations, and let you know I found your story motivating and inspiring! We plan to be living in the Camper in two short years, and begin our lives off the grid ((for the most part, of course!)) Thank you so much for posting everything you did, I hope you don’t mind but I’m going to have Kayl’s sit down and read this and hopefully it motivates her the same way it did me. I’d love to share pictures or horror stories when construction begins! I’d love to have you do a post for our “Making the Most With What We Have” series when you are able! Good luck with everything! Great story. Good things happen when we follow what God has planned for our lives. Thank you. I wish i could buy a house too. It is tough with husband did not manage student loan. Tired of life with two little kids. I will learn a lot from your blog to be frugal.